A few days ago I noticed I was very low on Thank-You cards, so I decided my next challenge entries would be Thank-Yous. 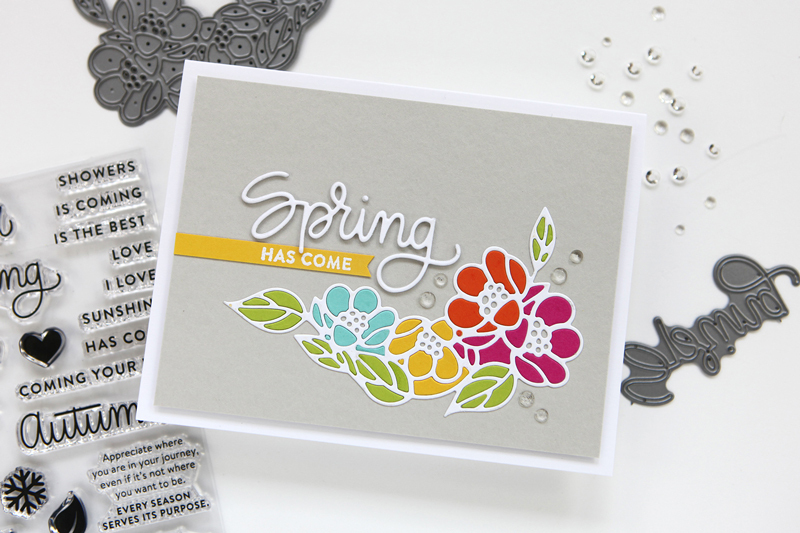 This card is for the Less is More challenge, using the colors yellow, blue, and gray. After seeing very cool cards by Cathy Zielske https://www.cathyzielske.com/images/2018/05/SpringHasCome2800.jpg, among others, for the Simon Says Stamp blog hop, I wanted to try my hand at the inlay technique. I've also seen it called letterpress. After die cutting an image, the cut-out pieces are glued back in place, either in the same color as the original die cut or in different colors. One of the reasons I chose the butterflies is because just finished a book by one of my favorite authors, Barbara Kingsolver, featuring butterflies in the plot. The book, Flight Behavior, is centered around the fictional migration of monarch butterflies from their traditional wintering spot in Mexico to a spot in the Applachians. A great read, offering authentic information about monarchs and the environment. But, I digress. I made three cards, each with a different background: gray, buff, and white, then mounted the die cut on white cardstock and glued the cut-out pieces to each using my Quickie Glue Pen . For the various colors I used blue, yellow, orange, and gray. I just love how the inlaid pieces look once they're glued in! For this version I made the sentiment a little differently, hand-lettering the Thanks and die cutting it using Cottage Cutz Double-Stitched rectangles. Then I adhered it using Darice thin foam strips. On these last two cards, I added a layer to a single butterfly, folding it to pop up and gluing it down with a dot of Gina K's Connect Glue. And of course, a few little jewels for embellishment, Little Things Rainbow Sparkle Mix and Pretty Pink Posh Clear Droplets. I die cut the card fronts for the gray and buff cards using my Spellbinders Card Creator. Then I embossed the white cardstock frame using Stamplorations Double Running Stitch die. For the card above I simply cut the card front from white cardstock using my Avery Elle Double Stitch Rectangle die. Inlay technique is fun and easy. Give it a try! Thanks for looking. Beautiful cards, Kathy ! I love all of them and especially the white on white card with the coloured butterflies. Your take on our colour combo is also eye-catching with the dark background. So great when the inspiration comes from a book, a movie or a song ! Thanks so much for sharing and for playing along at Less is More. Thanks, Izzy!I always have fun with the Less is More challenges!